MOSCOW, January 14. /TASS/. Russian tennis player Karen Khachanov defeated Germany’s Peter Gojowczyk in the first round of the 2019 Australian Open, which has $44.5 million in prize money up for grabs and runs between January 14 and 27. The 22-year-old Russian, who is seeded 10th at the tournament, battled out the German opponent in 2 hours 28 minutes with the final score of 3-6; 6-3; 6-4; 6-3. Leading 4-3 in the 3rd set, Khachanov asked for a time-out complaining of pains in a leg. 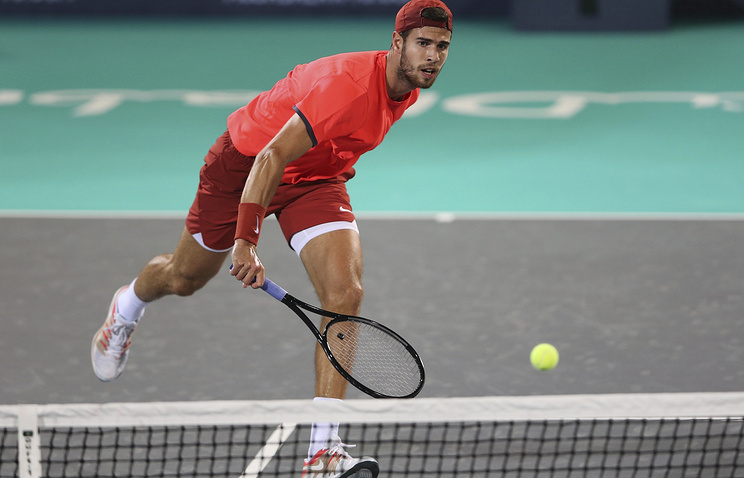 Khachanov, whose best Australian Open result was the second round in 2017, is set to meet this year in the second round with Yoshihito Nishioka of Japan. The 23-year-old Japanese tennis player cleared the first round on Monday by beating Tennys Sandgren of the United States 6-4, 7-6 (7-5), 4-6, 6-4. Hey Buddy!, I found this information for you: "Russian player Khachanov to face Japan’s Nishioka in 2nd round of 2019 Australian Open". Here is the website link: https://russophile.org/russian-player-khachanov-to-face-japans-nishioka-in-2nd-round-of-2019-australian-open/. Thank you.